MAKE ORGANIZING FUN! Do you ever feel like clutter is taking over your bedroom, the living room, or maybe even the entire house? The Storage Organizer makes cleaning up clutter in your home a fun game that the whole family will enjoy. 1.With different measurement methods and different computer monitor settings, please allow a little size deviation and slightly different in color. 2.WASH WITHOUT A HASSLE -- These toy chests use 600D Oxford fabric that is lightweight and amp; durable - What's more, you can easily wipe it clean without worrying about water damage! 【LARGE CAPACITY & DOUBLE LATTICE DESIGN】 - The size of this toy chest is 23.6" L x 13.7" W x 11.8" H. The toy storage could hold 63L items. It's large enough to hold all your baby's toys. Cardboard inserts keep sides stiff and 2 compartments can sort your accessories quickly and neatly, and makes them easy to find. 【THICK DURABLE MATERIAL】 - The toy box is made of 600D Oxford cloth, and the bottom is made of PU fabric, which makes the box waterproof, moisture-proof and stronger. 【COLLAPSIBLE WITH FLIP-TOP LID】 - The folding size of toy storage container is 13.7" L x 11.8" W x 1.9" H, it is easily for storage in closets, garages, and under beds, when out of use. The lid of the toy storage basket has a good dustproof effect, and it is hard to be flattened and can make the toy disappear in sight and make the room look clean and orderly. 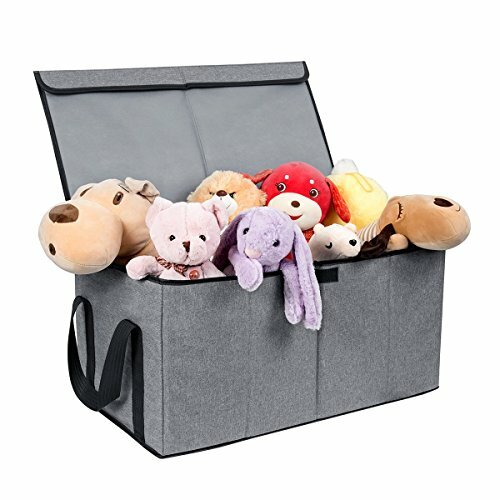 【PERFECT CLASSIFICATION WITH HANDLES】 - The storage organizer can not just store toys, but also a good closet organization systems for clothes, extra sheets, blankets and pillow cases. Keeping in the kitchen pantry to hold snacks, storing CD's putting the bin on a bookshelf. It suits in bedrooms, living rooms, school, nursery, daycare and other child playrooms. The storage box with a pair of handle is easy to carry and move, perfect for organization. If you have any questions about this product by ZERO JET LAG, contact us by completing and submitting the form below. If you are looking for a specif part number, please include it with your message.